Illuminated installations inspired by the structures of microorganisms were created for the BUGA festival in Germany by Stoke Newington design studio Loop.pH. Visitors could walk underneath the large, intricate structures that were made by weaving strong composite glass fibres. Ground-level LED lights make the fibres appear to glow. The festival took place in Koblenz, Germany, in May this year under the curatorial theme of Art Forms in Nature. We have previously featured an illuminated canopy installed in the entrance to London's Kensington Palace by Loop.pH as part of our Designed in Hackney showcase of creative talent in our local area. LICHTSTROEME returned to Koblenz, Germany after a successful first edition in 2011 during the Federal Horticultural Show (“BUGA”). The curatorial theme was “Art Forms in Nature” and the curators Bettina Pelz and Tom Groll invited artists who work at the interface between nature and arts in their works. 10 large-scale installations were built from the Electoral Palace along the Rhine banks to the Kaiser Wilhelm I Statue to the Fortress Ehrenbreitstein. All of the sculptures, projections and interventions made use of artificial light as one of their materials, so that they could be seen after dusk. Design studio Loop.pH used their Archilace technique on a new site-specific installation for LICHTSTROEME 2012 in Koblenz, Germany inspired by the work of Ernst Haeckel, one of the first transdisciplinary thinkers who bridged the gap between art and the sciences. 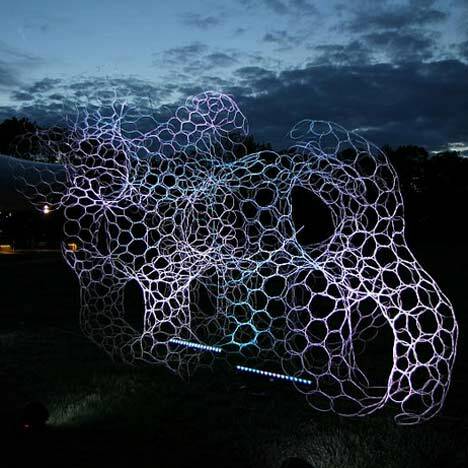 Micro structures observed in the natural world were blown up to architectural proportions to create an ephemeral and luminous outdoor installation that visitors could walk through and experience on a human scale. The built structures are based on Radiolaria - the intricate skeletons of mineral deposits left behind by ocean microorganisms. Radiolaria was first illustrated and depicted by Haeckel in the work 'Kunstformen der Natur' between 1899 and 1904. Archilace is lace-making on an architectural scale with strong composite fibres and is a method to craft space and reflect on the materiality and fabrication processes within the architectural practice. Archilace combines a parametric design process with a hands-on crafting technique. Weaving composite textile structures allows for virtually any imaginable surface to be created from a small number of parts. Recently discovered structures that were previously unbuildable can be fabricated by hand using a textile, curvilinear approach - breaking the rectilinear geometry of our built environment with a non-Euclidean geometry made from curved structural elements tangentially joined. Loop.pH is a London based art and design studio intervening at an urban scale to re-imagine life in the city. The studio was founded in 2003 by Mathias Gmachl and Rachel Wingfield, to form a new creative practice that reaches beyond specialist boundaries, mediating between digital & biological media and facilitating participatory environments and urban crafts. Loop.pH are internationally recognized for the design and fabrication of ephemeral textile architecture and living environments. They create urban utopias informed by ecologically based parametric design and principles of community engagement. The studio operates on the convergence between biology, ecology, architecture and design. Through intervention based work they create living environments, synthesising living materials and digital tools, and proposing an emerging new role for designers and artists working at an urban scale. The studio explores the role of art and design in public space and society, and consults on creative strategies and future scoping for industry, start-ups and the public sector, with hospitals, schools and regeneration agencies all commissioning their work. As a studio actively involved with education they lecture and deliver workshops internationally in a multidisciplinary context. Their artwork can be found in the permanent collections of the Museum of Modern Art (MoMA), NY, the V&A Museum, London and Lord Norman Fosters Private Art Collection, Geneva.